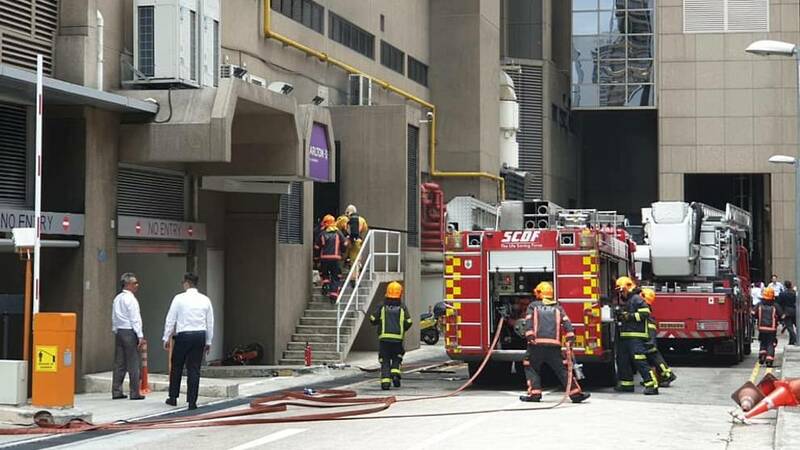 SINGAPORE - Smoke was seen wafting from a room at the back of the Carlton Hotel in Bras Basah Road on Thursday afternoon (Feb 14), with witnesses saying that they heard several loud explosions from the premises. The Singapore Civil Defence Force (SCDF) told The Straits Times that it responded to an incident at 76 Bras Basah Road, which is the hotel's address. 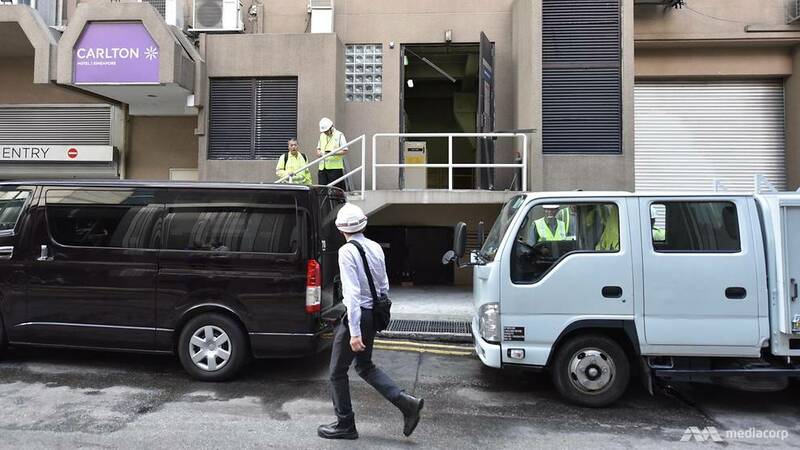 Public relations executive Jonathan Lim, 32, said that he was in Odeon Towers, which is next to the hotel, when the building's power supply appeared to be cut off at 1.15pm, with the lights and air-conditioning going out. He went out of the building and saw smoke coming out from a door at the back of Carlton Hotel. The door, which he said was "blown open", appeared to lead to a room containing power supply equipment, he said. "I was a bit shocked and alarmed. We saw some metal on the floor near the area," he said. There was also a strong smell of burning plastic, he added. Onlookers told him that they heard an explosion earlier. He said that he later heard a second explosion as he was waiting outside the building. Several hotel staff and members of the public were also evacuated. Photos of the incident showed two fire engines and several SCDF officers at the scene. Edited by Yamapi, 14 February 2019 - 02:56 PM. no wonder so many people gathering outside and fire engine, i was less than 100 meter away. Think also affect some power supply at Bugis Junction, i was there and suddenly some lighting blink and most of the escalators stopped. plaza Sing also have black out! Is this linked to blackouts in NEL stations Dhoby Ghaut and Clarke Quay? No SG under terrorist attack hor? OMG hope no one is injured. Carlton Hotel at Bras Basah is my favourite hotel to stay in Singapore. If expolsion at hotel may be their boiler explode if they have one. Maybe should avoid Carlton Hotels for a while. Seems like issue with switch gear, thus leading to black out in the vicinity. SCDF responded to a fire incident at 76 Bras Basah Rd at about 1.15pm. 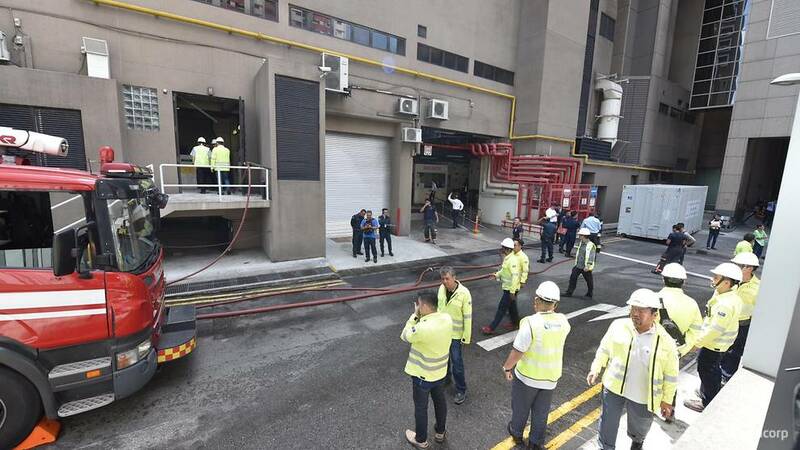 The fire, which was contained within a switch room, was extinguished by SCDF using fire extinguishers. SG damn happening these days. Edited by Yamapi, 14 February 2019 - 04:17 PM. The issue I am seeing here is that our Minister see these incidents as separate issue, and don't seems to have a proactive approach to deal with and prevent it!! SINGAPORE: A faulty voltage transformer at a substation in Bright Hill was the likely cause of the power failure that hit parts of Singapore on Jan 26, according to preliminary investigations by the Energy Market Authority (EMA). Speaking in Parliament on Tuesday (Feb 12), Senior Minister of State for Trade and Industry Koh Poh Koon said the faulty transformer had started a fire at the substation, after which electrical protective devices were activated to isolate the fault so that the downstream equipment would not be damaged. This resulted in the cut in power to the affected consumers, he added. "This is the first power failure incident involving a faulty voltage transformer in the past five years," said Dr Koh, who was speaking in reply to Non-Constituency Member of Parliament Leon Perera, who had asked about the extent and reasons behind the power disruption. Mr Perera had also asked about the trend in the occurrences of such power failures over the past five years and the steps taken to minimise such incidents moving forward. “While there may be a couple of incidences that happened in the recent past, they affect different parts (and) components for which the original equipment manufacturers are still looking at it." He added: "Until the investigations are complete, I will not draw any premature conclusion to say there is a trend linking all these different equipment and different components together." No wonder I hear Suntec area today have power failure. Hope no injury to anyone. Edited by Kopites, 14 February 2019 - 09:36 PM.